Examine your organization’s current processes and access detailed insights into the structure, costs, needs, and gaps related to fiduciary, operations, and governance oversight. Many foundations and endowments turn to consultants to choose investments, but get little information from them without the ability to access real-time performance data. Envestnet levels the playing field for nonprofits, bringing state-of-the-art technology and tools to help you compete and serve your donors. We provide fiduciaries with investment, administative, and operational tools to help them do their work efficiently, with transparency, and often with less cost. With the Envestnet platform, you can bring your systems and information up to speed so you can make better decisions and appeal to donors (and their advisors) as responsible stewards of wealth. We provide you with asset allocation tools and access to institutional-quality investment management solutions, along with aggregated daily reporting. And, we give you the ability to demonstrate to clients that their investments conform to their social standards or to the goals of their charitable mission. My technology is outdated and I need a system that can compete with services that banks, brokerage firms, and custodians offer. Envestnet’s configurable wealth management platform can not only help you stay competitive but also deliver a streamlined and more effective way to deliver advice. From risk assessment, portfolio analytics, and proposal generation to rebalancing, billing, compliance, and aggregated reporting capabilities, our integrated technology gives you the tools to conquer complexity and effectively manage your evolving business. I rely on my investment consultants for investment management but I need assistance with issues related to governance, portfolio administration, and reporting. While decisions around the investment portfolio are paramount, non-profits are often left to their own devices to perform other key functions of their business. With Envestnet, you can leverage a wealth management platform that offers transparency and fiduciary guidance. Access operational support around portfolio rebalancing, daily reconciliation and valuation, and cash management. And, deliver enhanced reporting that can be customized and made available online 24/7. I want to upgrade my technology to improve my services but I’m afraid it’ll be too expensive. By leveraging integrated technology and tools, non-profits can actually save money by streamlining their portfolio administration and operations and by gaining access to institutional quality investment insight. Our open architecture platform will give you access to a wide range of asset managers and investment strategies as well as institutional-quality performance reporting that aggregates, reconciles, and validates data on a daily basis. 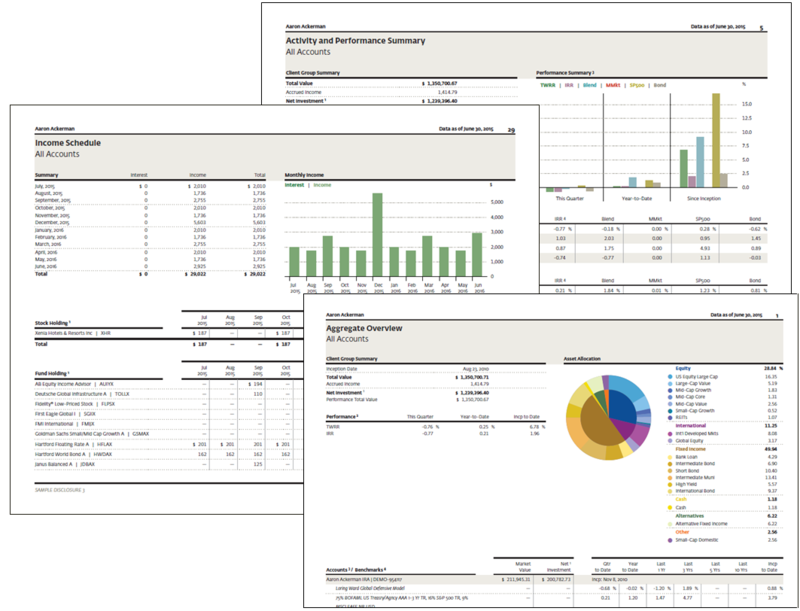 Provide insights on the market environment with a quarterly performance report to clients.